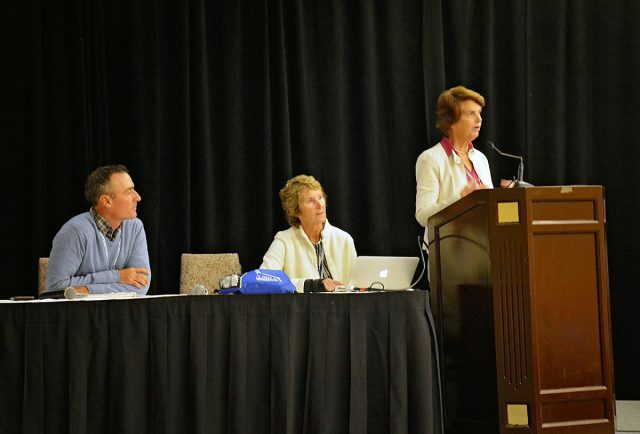 Marilyn Payne speaking about the new USEF dressage tests with Matt Brown and Gretchen Butts today at the USEA Convention. Photo by Jenni Autry. The new 2018 USEF dressage tests were unveiled last month, and those in attendance at the USEA Convention today were treated to a special preview of the tests. Marilyn Payne, Gretchen Butts and Brown, who worked with Sue Smithson and Mark Weissbecker to write the tests, all gave helpful tips in a packed session this morning. The A tests for all levels are introductory and track left. The B tests for all levels are more difficult and track right. All transitions and movements are mirror images in the tests. Free walks and medium walks are always separated as different movement. The free walks have all been extended to allow more time to show the movement. At Preliminary level all trot work is optional rising or sitting. In the Intermediate A test, medium trot is optional rising or sitting. In the Intermediate B test, rising trot is mandatory. When changing rein, don’t change your diagonal in the middle of the movement. Wait until the end so you don’t disrupt the flow. In the leg yield, the horse should be parallel to the rail with just a slight flexion at the poll. The horse should not have an exaggerated bend. In the counter canter loop, maintain the bend of the lead you are on. In a free walk you can have a long rein or loose rein. We have preview videos of five of the new 2018 tests thanks to David Frechette, Jennie Brannigan, Janelle Phaneuf and Hannah Sue Burnett. Scroll down to watch them all. Many thanks to Sue Smithson, Gretchen Butts, Mark Weissbecker, Matt Brown and Marilyn Payne for working on the new USEF tests. Bring on the 2018 season!